KATHMANDU, May 2:Candidates from various political parties in Kathmandu Valley as well as independent candidates filed their nominations for the local elections amidst much fanfare and enthusiasm, Tuesday. The aspirants for various posts including mayors, deputy mayors, ward chairpersons and members of various local units in the Valley arrived at the offices of their respective returning officers from 10 am onward, along with rallies of their supporters. The filing of nominations continued till late evening at various returning officers’ offices. People appeared very enthusiastic about the local polls, with party cadres escorting their candidates with lots of fanfare . The supporters also took out motorcycle rallies with their party flags. The Election Commission (EC) had opened an office of the returning officer at City Hall for registering the nominations of candidates contesting various positions in Kathmandu Metropolitan City. 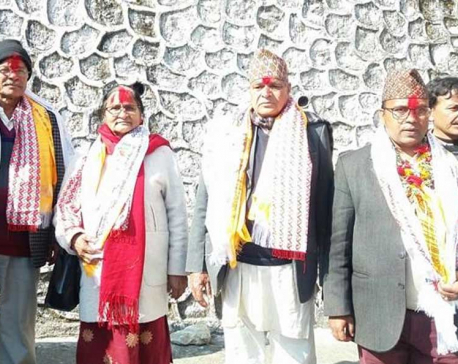 Candidates belonging to the Bibeksheel Nepali Party and Sajha Party as well as independent candidates were among those reaching City Hall first to file their candidacies. The atmosphere at City Hall had become more lively after the major political parties including Nepali Congress (NC), CPN-UML, CPN (Maoist Center) and Rastriya Prajatantra Party (RPP) started reaching there in the afternoon. After filing their candidacies, the candidates took the opportunity to share their plans and promises with the media. The ruling NC has fielded Raju Raj Joshi for mayor and Hari Prabha Khadki for deputy mayor of Kathmandu Metropolitan City. Likewise, another ruling party Maoist Center filed the candidacies of Sarwottam Dangol for mayor and Sushila Paudel for deputy mayor. However, the main opposition CPN-UML and the RPP forged an electoral alliance both in Kathmandu Metropolitan City and Lalitpur Metropolitan City. While the RPP has supported UML mayoral candidate Bidya Sundar Shakya in Kathmandu Metropolitan City, the UML in return has backed the candidacy of Raja Ram Shrestha for deputy mayor. Similarly, the UML has supported RPP’s deputy mayoral candidate Babu Kaji Maharjan in return for RPP support to its mayoral candidate Hari Krishna Byanjankar in Lalitpur Metropolitan City. 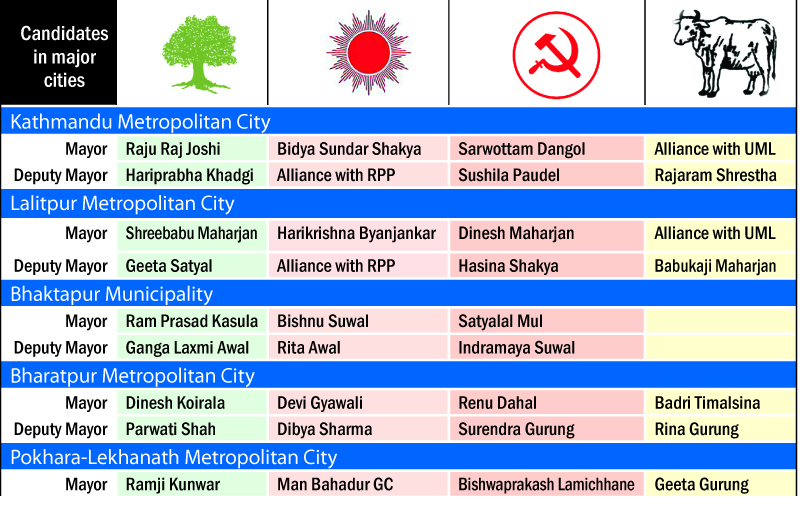 Altogether 21 candidates including Ranju Darshana of Bibesksheel Party and Kishore Thapa of Sajha Party, who are contesting as independents, are in the fray for mayor of Kathmandu Metropolitan City. There are 21 municipalities including two metropolitan cities in Kathmandu, Lalitpur and Bhaktapur districts. In Lalitpur Metropolitan City, NC has fielded Shree Babu Maharjan for mayor and Geeta Satyal for deputy mayor. Likewise, the Maoist Center has fielded Dinesh Maharjan for mayor and Hasina Shakya as deputy mayor. In Bhaktapur Municipality, the NC has fielded Ram Prasad Kasula and Ganga Laxmi Awal for mayor and deputy mayor respectively. Likewise, the UML has fielded Bishnu Suwal and Rita Awal for mayor and depuy mayo, respectively. The ruling Maoist Center has registered the candidacies of Satya Lal Mul and Indra Maya Suwal for mayor and deputy mayor in Bhaktapur Muncipality. Nepal Workers Peasants Party, which considers Bhaktapur its stronghold, has fielded Sunil Prajapati for mayor and Rajani Joshi for deputy mayor. Chief Election Commissioner Ayodhee Prasad Yadav had reached City Hall in the evening to inspect the nominations work being carried out by the returning officer. “The nominations process is going smoothly across all 34 districts today. I am very happy that our efforts have been successful,” he told media persons, expressing happiness over the registration of candidacies.